About winds: The wind is determined by an air moving caused by a different temperature and, therefore, by a different pressure from spot to spot, with a movement of the current from the area of high pressure towards that of low pressure. The intensity of the wind is never firm, and the dead calm is never absolute.In winter there is a predominance of winds coming from west, south-west and these are stronger than in other seasons in which winds come from east, north-east. It is prevalently wintry, it usually blows after a rich snowfall or after a sudden fall in temperature in the area in which it comes from. It can lift waves higher than those caused by “Pelér” and it can reach a speed of 20 mt. per second. It lasts 12 hours concerning the most part of the lake. With a stable weather it blows from 2-3 hours a.m. till 11-12 hours a.m and it is more intense in the oriental part of the lake. It concerns the northern and middle part of the lake. Then, with the increasing of temperature caused by the sun rising, it increases its intensity, reaching in summer also a speed of 12-15 mt. per second. It’s a lasting wind coming from the Po plain, it blows from south after the stopping of the ‘Pelèr’, usually from 12-13 p.m. till the sunset. During the summer this wind is stronger but it doesn’t concern the lake. It is less strong than the ‘Ander’ and can reach 5 mt. per second. 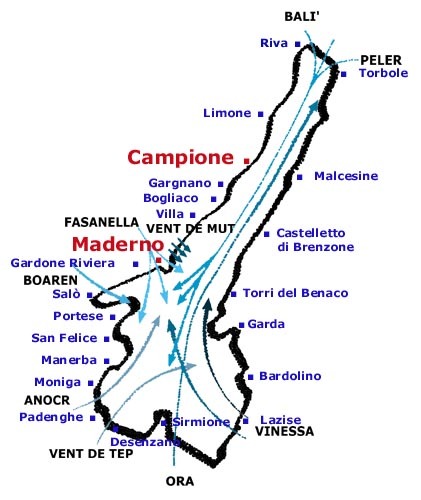 It blows on the northern part of the lake, starting from Maderno, while it doesn’t blow on the southern part of the lake, in particular during the summer. It blows from south-west, between Rivoltella and Padenghe, and sometimes between Fornaci and Manerba’s stronghold. It is a firm wind that begins to blow in the early afternoon and lasts some hours, while from Gargnano onwards it can blows during the night, too. It concerns mainly the lower Gardalake, but it can reach also the northern part of the lake to Riva. From the middle part of the lake it begins to lift lower waves than the “Pelér”, but they are different because are wilder. It is stronger than the ‘Ora’ and can reach 10 mt. per second. It comes from Val Sabbia and blows from west, north-west. It is a light summer wind that blows mainly in the morning and during the night coming out of the Salò’s Gulf, but without reaching the Veronese coast. It can reach 5-6 mt per second and it’s almost without waves. It gets out of the way the “Pelér” from Toscolano Maderno’s Gulf, where it makes the lake still. When it becomes stronger it announces nice weather. It’s a firm summer not very intense wind. It comes from the westside of Fasano after 14 p.m. and lasts till the sunset. It can reach the northern part of the lake becoming stronger; starting from Tignale it begins to rise and to lift up the waves. It stops if ‘Ander’ or ‘Vinessa’ come; usually it brings a nice weather and, like the ‘Montes’, it makes the lake become green-blue. Few hours after the rising of the ‘Bora’ or after the coming of disturbance in northern Adriatic, if the sky east-north-eastwards of Peschiera becomes dark, Vinessa is coming; this wind can become very dangerous because of its strenght and of the intensity of waves that it can lift up. It comes mainly during the summer while the lake is still and often it blows on the western side. The most dreadful is that coming from Toscolano’s valley because it is sudden, very violent and can sweep away also boats with lower sails. Mainly during the summer, when the lower part of the lake is covered by dark clouds, it’s possible that from this place come very intense winds, dangerous for every kind of boats. They last 20-60 minutes. The wave is reduced to powder and at the height of 1 mt. the air becomes unbreathable. Moreover, we say that not all the winds that blow on Gardalake have these features but only the main part. In these pages you can find maps of the ports of Lake Garda.